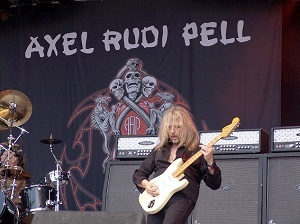 Axel Rudi Pell is the former German Steeler guitarist who has established a prolific career issuing albums under his own banner since the demise of his former band in the tail end of the ‘80s. Born in 1960 Bochum’s Pell established his band in 1989, recorded a demo featuring former Steeler singer Karl Holthaus and immediately issued an album called Wild Obsession through the Steamhammer label. This debut featured singer Charlie Huhn of Victory and drummer Jorg Michael who would go on to join 46% of all European metal bands. Although former Steeler bassist Volker Krawczak would also join the fold later the line-up has been fluid and very much interchangeable. The albums often have aristocratic or regal reference. Members have included singer Jeff Scott Soto, singer Rob Rock, keyboardist Christian Wolff and bassist Thomas Smuszynski. DVDs include 2002’s Knight Treasures (Live And More) and 2008’s Live Over Europe. Several compilations have also been issued including a covers album called Diamonds Unlocked. Axel Rudi Pell's The Crest, released by SPV, entered the German Media Control chart at position Number 22 in May of 2010. Axel Rudi Pell and co-producer Charlie Bauerfeind completed the recording of the next studio album, titled Circle Of The Oath, which would be released in March by SPV. Axel Rudi Pell would issue Live On Fire in March, 2013. A studio album was due that autumn. Axel Rudi Pell recruited Bobby Rondinelli formerly of Black Sabbath, Rainbow, etc. as its drummer. Axel Rudi Pell would release his next album, Game Of Sins, on January 15th, 2016 through SPV/Steamhammer. The band toured with openers Mob Rules. Axel Rudi Pell released his next album, called Knights Call, through SPV/Steamhammer in March. Axel Rudi Pell is back with another album titled for a king. And the music is fit for a metal king too. It is in many ways sad that Axel Rudi Pell is and is known as a solo band and artist. The band deserves a bigger profile especially on this side of the pond. Blame the label, blame the Germanic reputation or even the lack of enthusiasm for real metal, but whatever it is tip your hat to the guitarist and his many co-musicians for being so full of life, so energetic, so hard and so true after seventeen, yes seventeen, straight metal full-length albums. It is time the guitarist received some attention.